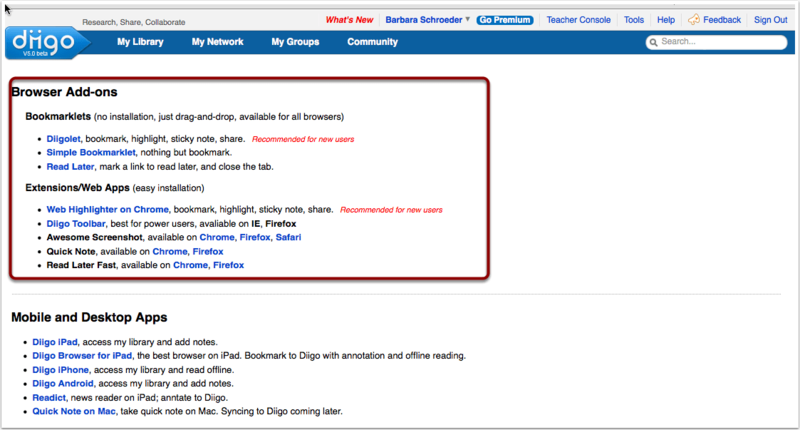 Diigo, an awesome social bookmarking, annotation, and networking tool, can often be a bit overpowering and intimidating to learn. 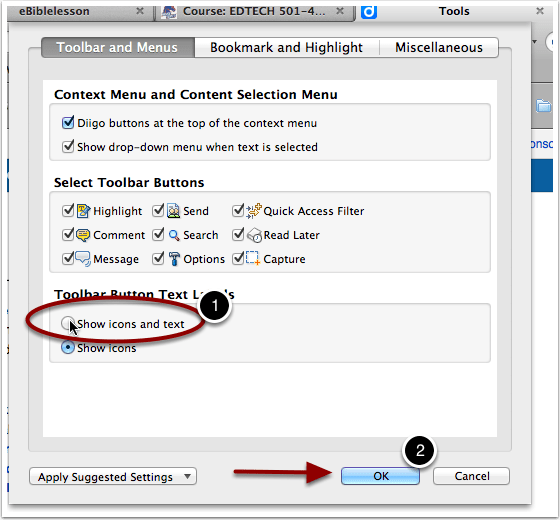 I introduce this tool in my EDTECH 501: Introduction to Educational Technology course, but I find some students have difficulties even understanding what Diigo is and how it works. 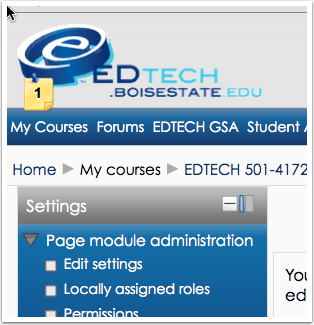 I encourage students to begin with baby steps, first joining a Diigo class group, exploring the tools available for educators, and bookmarking/sharing websites related to educational technology. From here, I introduce them to annotating websites, by commenting directly on their learning logs they begin to create in WordPress. But I find some still need additional support and tutorials to help them use these tools. Thus, the creation of a new Diigo tutorial (I use Clarify-It for most of my static tutorials now–it’s super quick and easy to use) to show how to annotate web pages and make comments on various content. I’d like to share it not only with my students, but with all of my readers. If you or your students are not using Diigo, I encourage you to set up an educator account (there is a basic free account) and get started. You will be amazed at what you can share and organize, and will most certainly change the way you conduct a lot of research and design group work in your classes. Click the Tools link on Diigo and install any of the tools that look interesting to you. You should at least install one of the bookmarks, annotation tools, such as Diigolet, Web Highlighter on Chrome, and/or the Diigo Toolbar. 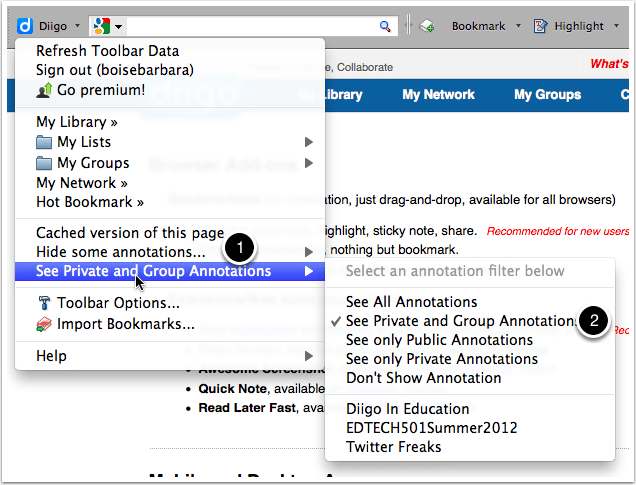 Decide which annotations you want to view by clicking the drop-down box in the Diigo toolbar. In this example, I choose to view my private and group annotations. 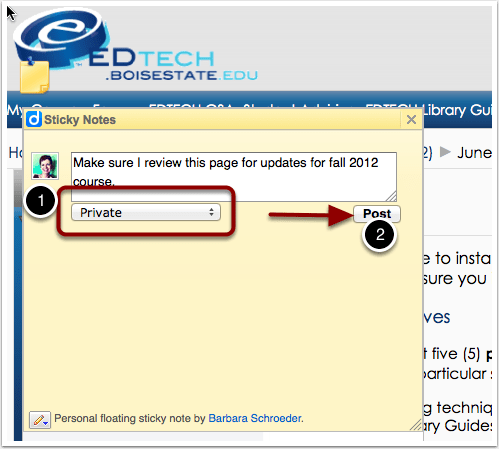 Private annotations are a great way to keep track of notes about web content and of course group annotations share your comments with the group. Click Options at the far right of your toolbar. Click the drop-down box Apply Suggested Settings. To help you identify the Diigo toolbar icons, I suggest also selecting Show icons and text. Your new toolbar will now be visible! 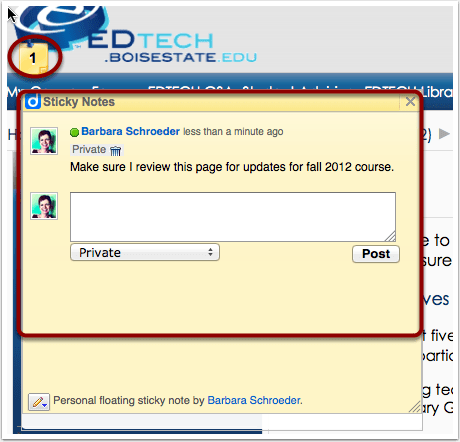 Click the drop-down arrove to the right of Comment on your Diigo toolbar. Select Add a floating sticky note to this page. Enter your comments, which will show up as a sticky note on the webpage. Select how you want your post to be seen. In this example, I will keep it Private. When you navigate to a page with notes you have set to seen in Diigo, you will see a sticky note icon with a number on it Hold you cursor over the note to new the contents. 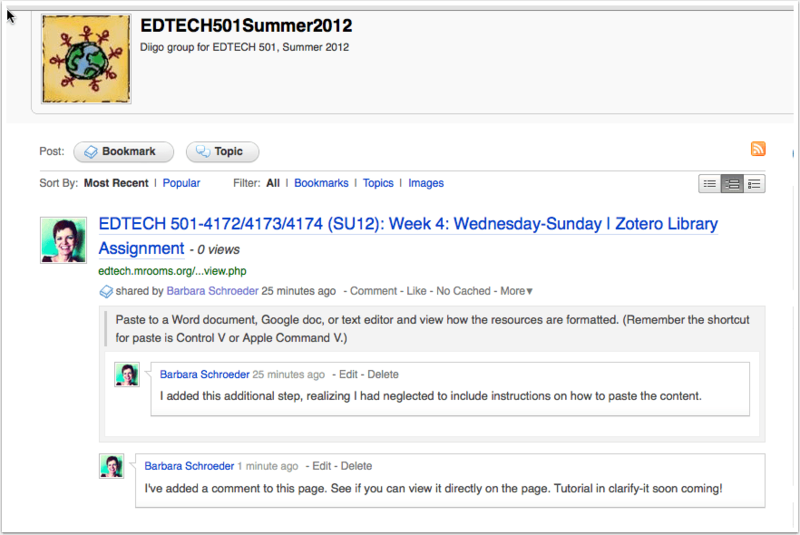 You can also select specific content on a page, highlight in in Diigo, and then add comments. 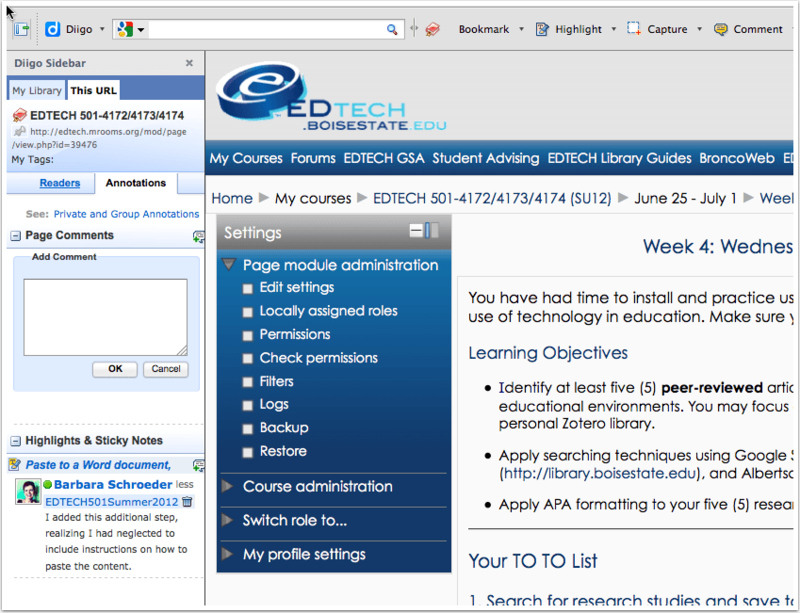 In this example, I’ve highlighted new content I’ve added to a Moodle resource page. 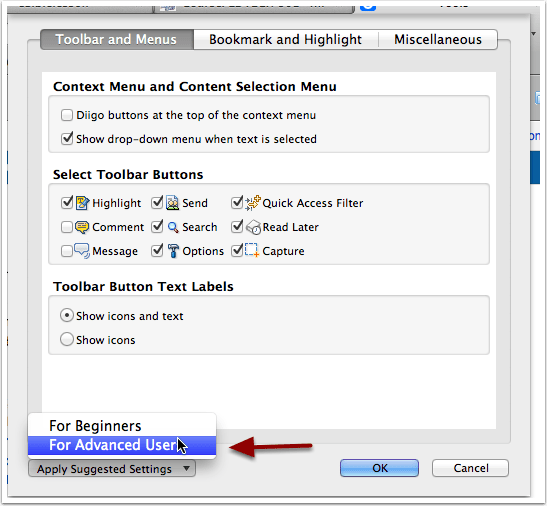 When you highlight, Diigo will recognize this and a dialog box will pop up next to your highlighting. Highlight your text and then select Highlight. A little icon with a pencil will appear at the upper-left. Enter your comments in the box and decide where you want your comments to be visible, in the drop-down box below your comments. Your highlighted text will now be visible, with a little icon at the upper-left, indicating there are comments about this highlighted content. You can also comment directly to a page. Click the drop-down box to the right of the Comment icon and select Comment on the whole page. 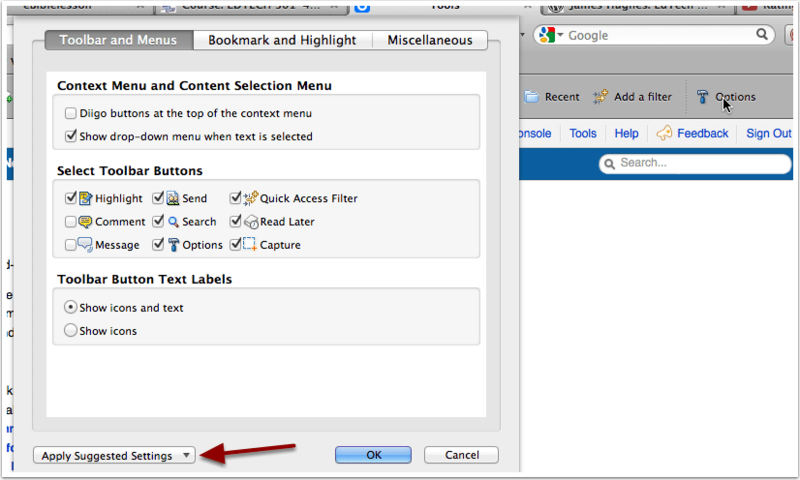 A sidebar will open on your browser window to allow you to add annotations to the page. Add your comments in the textbox and click OK. Your comments are automatically saved as Private. If you want them to be saved to a group, you will need to click drop-down box above the Page Comments and select that group. Of course, anything shared with your Diigo group will also be visible on your Diigo group page. Experiment with the various tools in Diigo and know how to annotate a page, highlight text and add comments, and how to comment on an entire page. It’s easy and very useful. Multimedia to Address Diverse Learning Styles? Set Up Google Hangouts Ahead of Time with Google Calendar Event--Sweet!